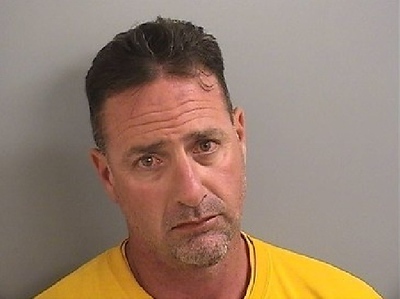 PLAINVILLE - A former Hartford detective arrested for allegedly driving under the influence in Plainville, in August 2017, and using racial slurs walked away with a clean record on Wednesday when the case against him was dropped. Robert Lanza, 44, of Wolcott, successfully completed both the court’s Alcohol Education Program and Accelerated Rehabilitation, officials said at his hearing in Bristol Superior Court. Charges of operating under the influence and interfering with police were dropped. Lanza, an 11-year member of the Hartford Police Department, was found to have violated his department’s code of conduct, specifically conduct unbecoming an officer, according to a statement issued by Hartford Dep. Police Chief Brian Foley in January - when it was announced that Lanza had been fired. Foley said the finding was made after an internal affairs investigation. Lanza was arrested Aug. 27, 2017. Early that day, at about 12:18 a.m., Bristol police received reports that a vehicle was swerving all over the road, nearly striking the guardrail, on Route 72 before driving into Plainville. Plainville officers then found Lanza parked in the entrance of 72 Commons with his engine running. He appeared “extremely intoxicated,” as his speech was slurred and he smelled of alcohol, police said. According to police, Lanza admitted that he was a Hartford police officer and refused to answer questions on whether he had anything to drink or where he was coming from. He also failed field sobriety tests, which he couldn’t perform without swaying, police said. “These actions were egregious, deplorable and completely unacceptable for a Hartford police officer, and are grounds for termination even before considering their present and future detrimental effect upon the operations of the Hartford Police Department,” Foley continued. Posted in The Bristol Press, Plainville on Wednesday, 5 December 2018 13:01. Updated: Wednesday, 5 December 2018 13:03.